Ski Vail, Whistler Blackcomb, Heavenly, Park City and MORE with the Epic Pass. Get 2 Buddy Tickets for a limited time only for just $49 down! 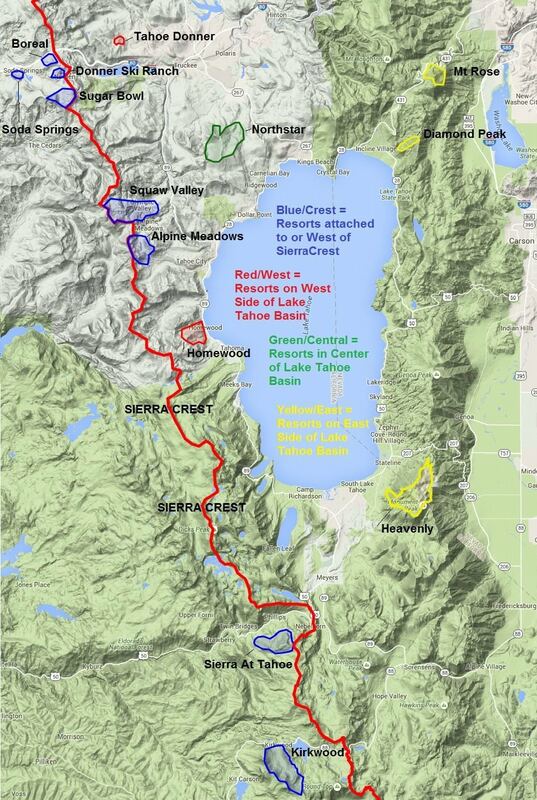 Explore Pass Options. A quick update on the Monday storm as you are enjoying beautiful weather on this Saturday. It's sunny with highs in the 50's and light winds. For Sunday we will see increasing winds, with gusts to 70+ mph possible on the mountain tops by afternoon. That means we will likely see some upper mountain lifts close on the wind prone mountains. Still mild Sunday with partly sunny skies and highs in the 40's on the upper mountains to 50's at lake level. Monday the next storm moves in. We will see ridgetop gusts continuing to blow at 70+ mph closing some upper mountain lifts. Highs only the 30's on the mountains and 40's at lake lever possible in the morning. The heaviest precipitation looks like it will push in Monday afternoon. 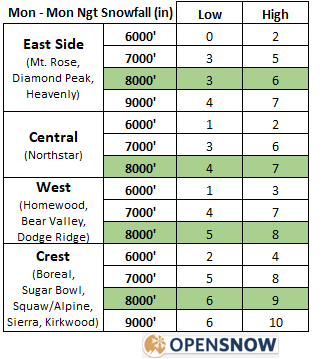 Snow levels look a little lower on the latest model runs. They could start around 7,000 feet and then fall near lake level by Monday evening. The heaviest snow could fall Monday evening with the front, and then lingering snow showers into Monday night with snow levels lowering as low as 5,000 feet. 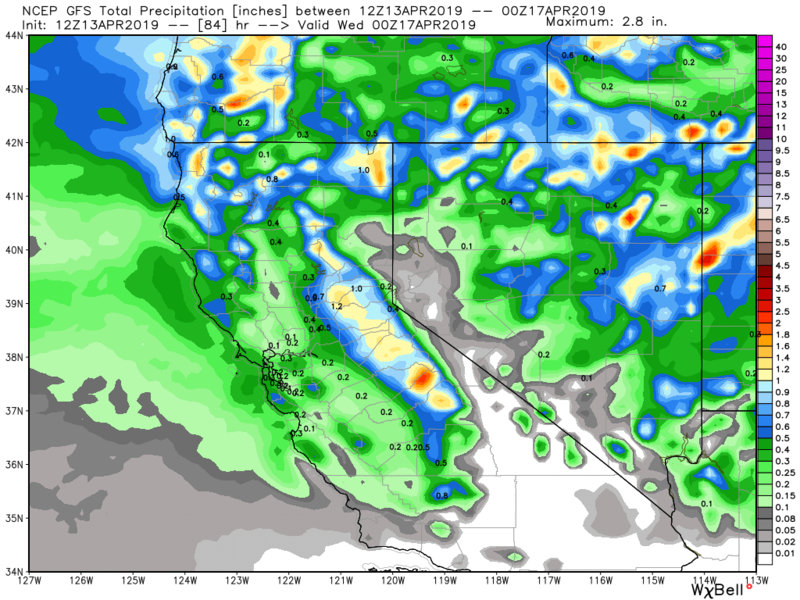 Total precipitation amounts continue to trend up slightly on the latest model runs. The total model average is now up to 7 tenths of an inch of total precipitation possible along the crest. The GFS/European model average is up to 8 tenths. Here is the updated snowfall forecast by Tuesday morning. I'd lean towards the lower amounts with the warmer surfaces, but the higher amounts possible where snow showers fire up behind the front Monday night, and where snow falls on snow. We should clear out on Tuesday with winds coming down and temperatures warming into the 40's. High pressure builds in through the end of the week with sun and warming temperatures. We could be in the 50's Wednesday through Friday, and even 60's at lake level by the end of the week. We could be done, at least with measurable for a while, or maybe even the season? We seem to get snow every other Memorial Day so snow is not out of the question in May.